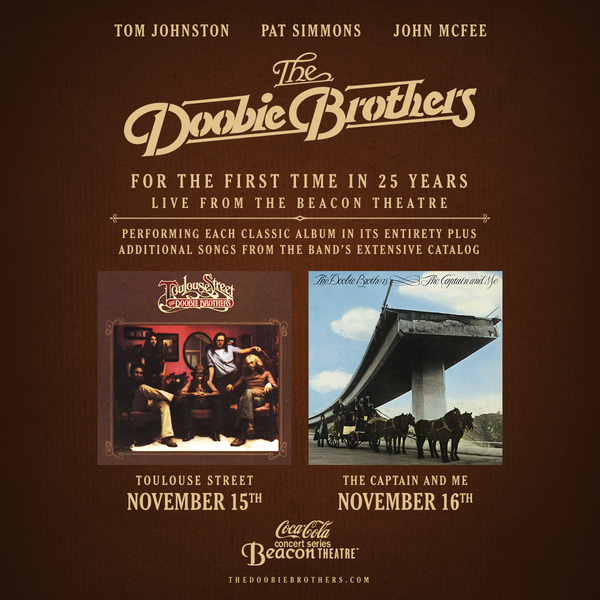 The Doobie Brothers announce their first ever full-album performances, on two historic nights in New York City at The Beacon Theatre, November 15 and 16, 2018. The band will perform Toulouse Street plus select hits on Thursday, November 15, and The Captain and Me plus select hits on Friday, November 16. This is definitive Doobies at their most powerful, and fans will delight in hearing the deep cuts, some of which the band has never played live in concert. These shows mark the first time The Doobie Brothers have performed at the Beacon Theatre in 25 years. Tickets for both shows go on sale July 23, 2018 and are available via TheDoobieBrothers.com. Fans will have first access to tickets for both nights starting tomorrow, July 17th at 10am local. Use code DOOBIESNYC. A limited number of special VIP packages will also be available, including premium seating, pre show meet & greet with band, exclusive commemorative merchandise & more! These back-to-back classic albums represent one of the greatest one-two vinyl punches of the 1970s; the LPs that put the Doobies on the map and on the path as one of the most iconic bands of their generation. Many of the songs on both of these albums are still played every day on the radio, a testament to the timelessness of the music. These historic performances will no doubt go down as some of the most important shows the band has ever played, right up there with the classic 1975 Bill Graham S.N.A.C.K. concert in San Francisco to the 1979 No Nukes shows at Madison Square Garden. “We are excited to be returning to The Beacon Theatre and to have the chance to perform these albums for our fans in such an intimate setting. Playing these tracks live that we haven’t played since we recorded them is going to be an undertaking we are looking forward to,” adds The Doobie Brothers. Click HERE for a full list of upcoming tour dates.